It’s not uncommon for us to see cases and accessories for a new handset appear before the device itself has been unveiled. Online retailer Mobile Fun listed and started taking pre-orders for official Galaxy Note 7 accessories in July last year. 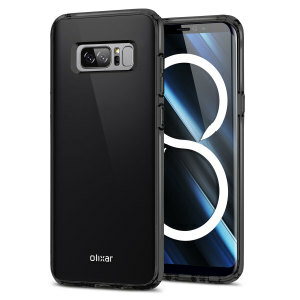 Today, the retailer has made the official Galaxy Note 8 cases from Olixar available for pre-order. It is widely believed that accessory manufacturers are often the first to get information about an upcoming handset’s design so that they can get their products ready in time for launch. Their product images are accompanied by somewhat accurate renders of the unreleased device which provide us with a good look at a device that’s not even official. 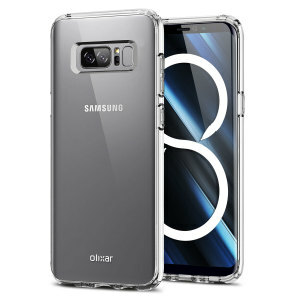 The Galaxy Note 8 renders included in Olixar’s product images suggest that the handset is going to have an Infinity Display that’s going to be slightly larger than the one found on the Galaxy S8. A big cutout at the back reveals the dual-camera system and the fingerprint sensor. If this is accurate then it appears that the Galaxy Note 8 won’t come with an optical fingerprint sensor as well. It also merits mentioning here that the fingerprint sensor appears to have been distanced a bit from the camera by the heart rate sensor. This should address complaints of accidentally smudging the camera lens that’s inevitable on the Galaxy S8. 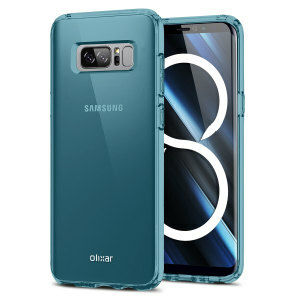 The colors of these cases suggest that the Galaxy Note 8 will be available in Black, Silver, Gold and Blue colors. The cases and additional accessories like the wireless charging case and 2-Piece Pop Cover are all available for pre-order from Mobile Fun. I so need a new Note, can’t wait for the Note 8 to be released. Camera lenses positioning and fingerprint scanner location make one want to throw up. Fingerprint sensor placement doesn’t bother me. Only used Iris scanner on Note7. I will be delighted if this camera set up is correct and it’s horizontal. That vertical setup is the ugliest possible design. In fact it’s so ugly I am doubting that this setup will be on the iPhone 8 either. It just looks bad. I need a Note for work so if it turns out to be vertical I’ll still buy it, but I sincerely hope not. I doubt it as Samsung does not do ugly. Fingerprint scanner positing is certainly bothersome. I still have my Note 7 and the iris scanner is suboptimal. I will have to get the Note 8 because my Note 7 is laggy and has had no updates and I actually need a Note, bu the fingerprint scanner location is unfortunate. I’m on the verge of not getting this phone just because of the severely retarded location of the fingerprint scanner. To much things are in the backside. It just looks terrible. They have to remove the heart rate sensor. The most of us are not using it or rarely using it. The camera fauture like tab the heart rate sensor to capture selfie can be easily made for fingerprint scanner. Just touch the fingerprint scanner on the back and voilla. Or double tap finger print sensor to start camera. Samsung really messed ùp with the backs of this years flagships. I didn’t think they’d go worse than the S8 but they managed to do it.